I think Spring has finally graced us with its presence and about time too! 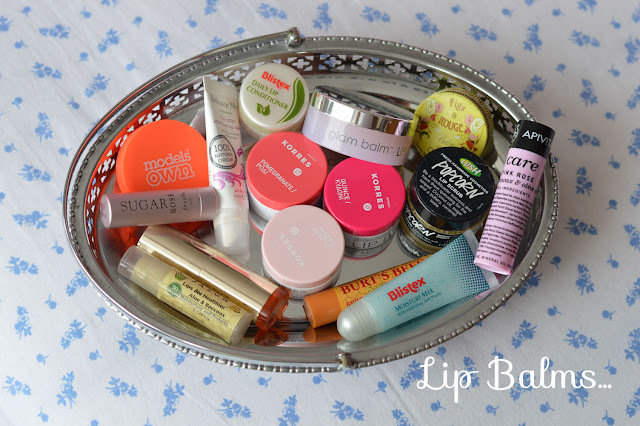 Having said that I have been reaching for the lip balm a lot recently, I have a secret crush for lip balms. I use them all year round especially in the colder months. 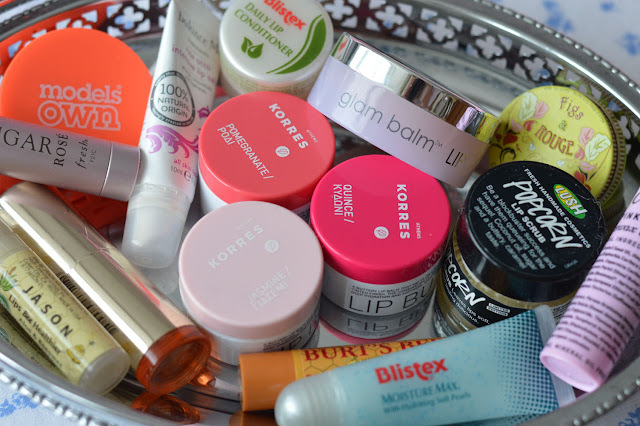 I have lip balms in my handbag, in the car, in makeup bag and by my bedside. I even find them in coat pockets and my jeans!I tend to store them in a little vintage silver tray I found from a charity shop. You can read my Prettying Up Your Dressing Area if you enjoy some storage ideas. So I thought this would be the perfect chance to share with you my favourite lip balms, I would struggle to say I have one favourite. I love to use them all for different reasons, whether that be because they smell good or add a wash of colour or help soothe sore dry lips. In terms of tinted lip balms my favourites are the Clarins Instant Smooth Crystal Lip Balms, they smell amazing, easy to apply like a lipstick and most of all leave the lips soft and hydrated. I have been using the shade Crystal Mandarin from the new Splendours collection. the perfect shade for Summer. The Korres Lip Butters are also a firm favourite, I like simple packaging and they too leave a lovely wash of colour on the lips whilst hydrating the lips. My favourite is Jasmine, a sweet scent with a pretty opalescent tint. Blistex has been a favourite brand of mine for years, I have a love hate relationship with their Relief Cream. The product itself is fantastic but the packaging not so. Anyway my new favourites are the Moisture Max, ummmm if you love spearmint you'll love this. It smells yummy and fresh and feels lovely on the lips. I like the tub packaging the domed shaped head for applying. The lip balm is packed full of moisture beads which contain shea butter and aloe vera. The second favourite is their Daily Lip Conditioner, I've really enjoyed using this and have even popped this in handbag. It's a great all round lip balm, olive oil, aloe vera and grape seed oil help keep the condition of your lips in tip top condition. lip tints so if you've tried them please let me know. Another Greek favourite is the brand Apivita, I am almost through my Chamomile lip balm which is probably my most used lip balm. I also like to use the Pink Rose one if I fancy a little bit of colour. They have a good selection of different scents so I think next time I may pick a different one to try. Other firm favourites are Fresh, Burt's Bees, balance me, glam balm LIP and Models Own. My favourite lip prep is the Lush Popcorn Lip Scrub, this is my favourite lip scrub to use partly because I enjoy licking it off my lips! Oooh my 1st visit & I stumble upon one of my fave beauty item! I'm ashamed to say I've not tried Korres yet and I definitely have to look more closely at Clarins. Lovely post! My fave lipbalm at the mo is Nivea lip butter! The raspberry one literally smells like yogurt! it's amazing! I love lip balm too, I'm kind of obsessed with any lip products! My favourite lip balm is MyChelle's, it's massive and does last months. I believe MyChelle is an American brand, I got some of their lip balms from Vitacost.com. I have the one smells of cherry and pineapple and another one smells or vanilla and orange. They smell so good and does work!